Nowadays, with data erupting like a volcano, people have to spend as much as plenty of time on managing the complex statistics. Regarding this business challenge, we make a comprehensive solution for all of our customers. With our ending device — the Wireless Smart Multi-Sensor Device WS1, you are able to access the environmental data remotely via your phone. 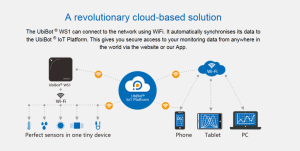 Thanks to the WiFi connectivity and our user-oriented App, your data are synced in real-time and can be viewed instantly at anytime and anywhere in the world. While, the App works just like a window where your data are displayed. The core technology is our UbiBot® IoT Platform. 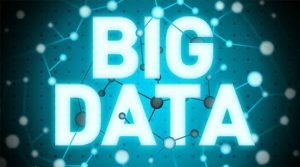 It offers all the features to process the huge amount of data, including secure data management, intelligent alerts, unlimited storage and data analysis. With the default data sync interval or your customized settings, the device will automatically sync the data to our platform and store it securely in the large memory. You can not only view the real-time data, but also check the history record and compare with current conditions. The visible charts give you direct insights and tell the highest and lowest point. If you need to archive the records, click “Download” on the export page to save the readings as CSV file. 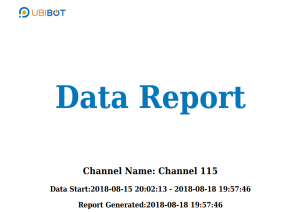 The platform also analyses your raw data and produces periodic reports. This will benefit you in business summary. Apart from the storage and visualisation, the platform also allows you to set customised alerts. The threshold, the alert types, and the receiver, all can be set individually on the web as well as in the App. For business users, you might have trouble in managing multiple devices at the same time. The “Group” function ensures your easy operation by separating devices into several groups. In addition, you are able to share your device to your colleagues or your boss. Make sure important conditions are under close supervision. We also open up our RESTful API, offering you the chance to develop your own monitoring solutions. It is being called “IoT” (Internet of Things) to sense physical data and connect things with internet. We are working to make the IoT solutions smarter and easier. Thanks for your interest in the UbiBot wireless sensing solutions. We will work harder to provide the best service for you.